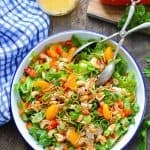 With so many layers of flavor and so many delicious textures, this Chinese Chicken Salad with Cashews is a perfectly satisfying warm weather meal! Add all ingredients to a jar with a tight lid and shake until completely combined. Refrigerate for up to 1 week. In a large bowl, toss together chicken, celery, lettuce, bell peppers, onions, and oranges. Add enough of the dressing to lightly coat. Chill, covered, for up to 2 hours (or serve immediately). When ready to serve, divide evenly between four plates and garnish with cashews and chow mein noodles. For a lighter salad, try decreasing the amount of cashews and chow mein noodles that you use on top. You can also cut the dressing to 1 tablespoon per serving.